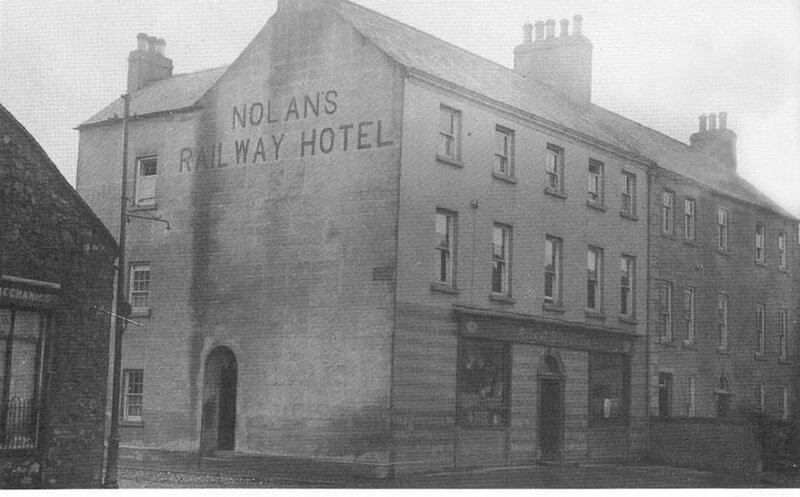 Nolans Railway Hotel (now The Irishman's Pub where George Bernard Shaw stayed. Image from Carlow in Old Picture Postcards' by Michael Purcell. Situated in one of the best trading positions in town, on the Dublin Road, opposite the Court House The Irishman's has been in the same ownership for over 40 years and during that time has built up an excellent reputation. The following is from 'Carlow in Old Picture Postcards' by Michael Purcell. 1994. Image 47. The Railway Hotel was also a grocery and bar. Miceal O'Nuallain had his name in Irish over the door, so the premises became known as the Irishman's. In 1918 George Bernard Shaw stayed here as a guest. Later he was to recall: 'The proprietress presented a joint of Carlow Pig for supper, I explained that I did not partake of dead animals or their product, to which she replied, you won't last long without'. Some thirty years later G.B.S. was secretly administered meat products in his soup, he died shortly afterwards at the age of 94! The purpose of Shaw's visit was to inspect seventeen Carlow properties that he had inherited. Later he was to donate the properties to Carlow U.D.C. In 1990 a plaque erected by Carlow County Heritage Society acknowledged Shaw as a benefactor of Carlow. Today the U.D.C. distribute funds accruing from his legacy to subsidise cultural projects. In 1959 the premises was acquired by John Hargaden, he continues to trade under the name of 'The Irishman's'.